The Florida Board of Professional Engineers (FBPE) has determined that all professional engineers (PE) have to acquire and use a seal that complies with all terms of the current Rule 61G15-23.001. The Florida Engineering Society is pleased to offer these Board approved seals. Model revisions are always current, and you are assured of fast service at a very competitive price. To order any of the seals, print the order form and mail or fax the form with payment to the Florida Engineering Society. For additional information, email or call FES Headquarters (850) 224-7121. Enhance your professional image with custom made frames. All frames are double matted ivory with black trim. Frames are self loading for easy installation. Please do not send your certificate. 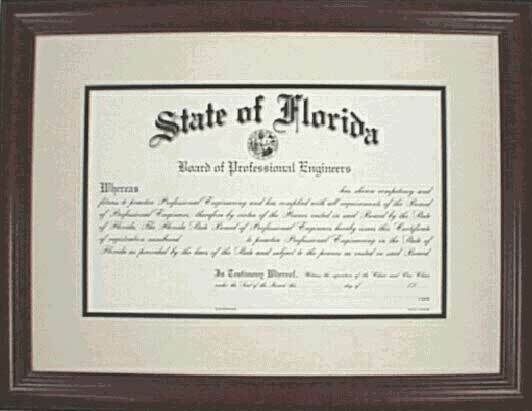 To order any of the frames, print the order form and mail or fax the form with payment to the Florida Engineering Society.